You Will Eat Your Vegetables! Fregola | I Am Not A Restaurant! If at first you don’t succeed, try, try again…with pasta. Fregola, or fregula, is just another word for what children and adults like best. This Sardinian import is typically semolina dough rolled into teeny balls and toasted in the oven. It’s like the Mini Cooper of pasta – so cute your reluctant veggie eaters will dig into broccoli before they know what they’re doing. Bring large pot of salted water to boil. Cook ½ package or 8 ounces of fregola according to directions (10 minutes for me). Drain when done. Meanwhile in large heavy weight skillet over low to medium heat, warm olive oil. Cook onion with a few salt pinches 5 minutes, add pepper and garlic. Cook 3-5 more. Add broccoli, stir a minute. Add ¼ cup liquid and steam 3 minutes with lid on. Add fregola, tossing. Add ¼ cup more liquid and let soak into fregola. Season to taste with salt & pepper. Sprinkle with cheese. Note: Fregola is usually more expensive than your on sale pasta, BUT, it’s way less expensive than steak, fish, chicken etc. Note 2: Add boccoccini or a vegan sub and make it a meal. Sautéed chicken works too – Season chicken filets with salt and pepper – garlic too if you prefer. Cook first, cut up and toss into pasta at the end. 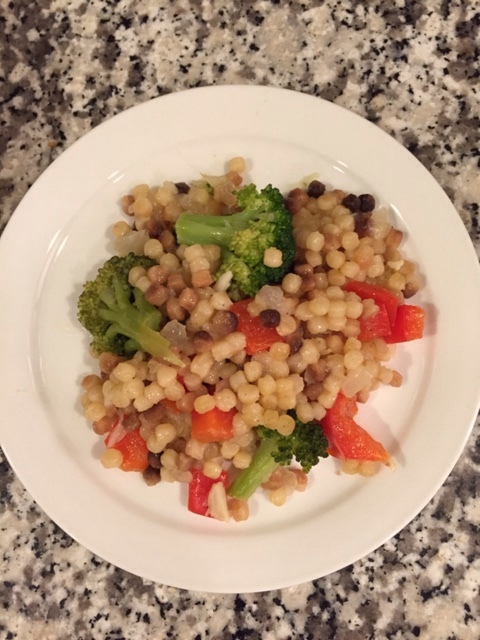 Mar4March 4, 2015 • By Betsy Karetnick • This entry was posted in Dish of the Day, fregola, Kitchen Help, Recipes and tagged fregola, veggies. Bookmark the permalink. Making this, I’m Vegan rest of family isn’t….so this works for all of us! Thank you!